Lathe machine Retrofitting with NC system Hust / NERI Controller with 4-station tool turret Pragati make. We are amid one of the renowned names involved in presenting to our clients CNC Lathe Retrofitting Services. We manufacture Retrofit lathe and Milling Machine with FANUC, Mitsubishi, HUST Controller with Servo Motor as per customer requirement. We have sourced hardened lathe beds and using them, we convert the manual lathe machine into a CNC lathe. Different spindle options, turret options, turning and milling are all possible and can be offered at economical cost. Captivating on the skills of our professionals, we are involved in rendering Lathe Retrofitting Service. 6 VTL’s retrofitted at M/s Wheels India Ltd, Chennai with 2 axis CNC Siemens 802 D. The machines were manufactured by Berthies , Schies , Dorris , WMW, Kirloskar and Webster & Bennet. 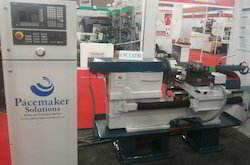 Conversion of conventional Grinding, Milling, Lathes to CNC controlled machine tools with Design, adaptation of ball screw drive for axes control, Hydraulic / Pneumatic accessories.